When most people think of a workplace injury, they likely think of a single accident that caused a traumatic injury such as a fracture, sprain, or strain. Additionally, workplace injuries are most often associated with individuals who perform some type of physical labor as part of their job. However, many workplace injuries arise over time as a result of repetitive movements that cause stress to the body parts. Just like traumatic injuries, repetitive stress injuries can cause serious pain and may require extensive treatment including surgical repair. Employees who develop repetitive stress injuries have the same rights to workers’ compensation benefits as employees who suffer traumatic injuries. Repetitive stress injury lawyer Kenneth P. Carp protects the rights of workers who have suffered on-the-job injuries, so please call today at 636-947-3600 to discuss your situation today. The above conditions can result in aching, cramping, pain, stiffness, weakness, tingling, numbness, and other symptoms that can make even the most basic everyday activities challenging. Victims suffering from these conditions should seek medical attention and often require medication to control pain, physical therapy, or often surgery to repair the damage caused by the repetitive strain. Often, victims of repetitive stress injuries are unable to return to work immediately and perform the job duties that led to the injury. During recovery, workers’ compensation benefits can provide valuable assistance for medical costs, lost wages, and more. 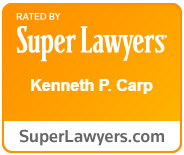 If you have sustained an injury and would like to learn more about your rights to workers’ compensation benefits, do not hesitate to call a skilled National Workers’ Comp Attorney at the Law Office of Kenneth P. Carp today. We will help you obtain the benefits to which you are entitled, so please call 636-947-3600 for a free consultation.